Welcome to the announcement post of my readathon: #UnsolvedAThon! This readathon is based on the youtube series Buzzfeed Unsolved, where supernatural believer Ryan tells his friend, skeptical Shane, about a famous supernatural or true crime case — all of which are unsolved. If you haven’t heard of this series, watch the episodes here! I’ve been a fan of Buzzfeed Unsolved since the second season, after my sister introduced me to the show, and I’ve told so many friends about this series who have then gone on to watch it and love it. So I wanted to show my appreciation for the show; originally I had planned a book tag but someone beat me to it (no hard feelings! haha). I then decided to create a readathon, which I think is going to be super fun! On March 14, I’ll be posting a massive blog post featuring book recommendations for each reading prompt. Scathie is a Melbourne-based artist. When she’s not at uni, she’s working on a webcomic about a very queer vampire trying to make it through art school. You can find her on instagram @scathiee, or on Tumblr @scathieedraws. There are two avatars you can play as: Ryan or Shane. Depending on which avatar you choose determines which path on the Investigation Board (the game board/bingo board) you take. There are 10 episodes of Buzzfeed Unsolved for each avatar path: five supernatural episodes and five true crime episodes. These episodes work as “clues” that will help you solve the unsolved case! In order to solve a clue, you need to read a book that relates to that episode. Once a clue has been solved (meaning you’ve read a book) you can move onto the next clue by following the red string. Solve all 10 clues (read all 10 books) and you’ve solved the unsolved case and completed the readathon! On April 1, start reading and track your progress either through your blog or on a Twitter thread! Make sure to use the #Unsolvedathon hashtag! Choose which avatar you want to play as, which will then determine the path you follow on the game board. Are you more like Ryan, a true believer in the supernatural and conspiracy theories? Or are you more like Shane, a skeptic who will only believe in things like ghosts and demons if you have the proof right in front of you? At the top of the Investigation Board, you’ll find Ryan’s Path and the 10 clues you need to solve to complete Ryan’s Path and solve the unsolved case. At the bottom of the Investigation Board, you’ll find Shane’s Path and the 10 clues you need to solve to complete Shane’s Path and solve the unsolved case. You only choose one path to take (unless you finish the readathon early and want to start again). Each clue is a Buzzfeed Unsolved episode and in order to solve the clue, you need to read one book that relates to that episode. Under the “Investigation Board” heading, you’ll find a detailed explanation of each episode and a reading prompt to help you choose what type of book to read for each clue. But don’t fret: there are ways you can cheat and solve the case faster too (which is explained under the “Extras” heading)! For every clue you solve (meaning, for every book you read), you move forward one spot on the Investigation Board by following the red string to the next episode. 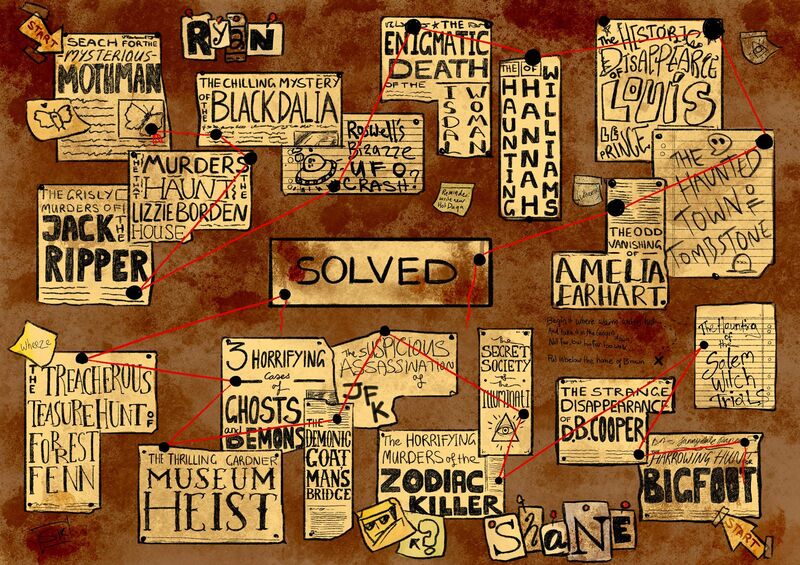 You must read a book for every episode on your chosen path to gather all the clues in order to reach the middle of the Investigation Board and solve the unsolved case! An explanation of each episode and the matching reading prompt is below the game board. The Search for the Mysterious Mothman: The Mothman is a legendary figure, believed to haunt Point Pleasant, West Virginia. He was first seen in 1966 by a group of teens on a drive. No one knows where he has come from, but many believe him either to be some sort of alien or to have come from another universe. Read a book about a mythical creature or a monster. The Chilling Mystery of the Black Dahlia: Elizabeth Short, also known as the Black Dahlia, was found murdered in Los Angeles, California. She had been mutilated and her body severed at the waist. It is one of the most famous unsolved murder cases, due to its brutality. Read a very well-known/famous book. The Murders that Haunt the Lizzie Borden House: Lizzie Borden became famous after she was the main suspect in the axe murders of her father and stepmother. Although she was tried and acquitted, many still believe she committed the murders. Read a book with an anti-hero or villain as the main character. The Grisly Murders of Jack the Ripper: Jack the Ripper is the alias of an unidentified serial killer that made his mark on the Whitechapel district of London in 1888. He murdered five women before suddenly disappearing. His identity remains a mystery to this day. Read a book about a serial killer or a murderer. Roswell’s Bizarre UFO Crash: In 1947, something crashed in the desert near Roswell, New Mexico. The U.S. government was on site immediately after and the media published a report that an “flying saucer” had been captured. The military denied the claim and stated it was a weather balloon, but ufologists and other conspiracy theorists claim it was an alien spaceship and that the government seized the alien creatures onboard, covering-up the incident. Read a book involving aliens or outer space. The Enigmatic Death of the Isdal Woman: An unknown woman was found dead in Isdalen Valley in Bergen, Norway in 1970. Her body was partially burned, and later, the police found that her clothes had their labels removed and that she owned at least eight passports, leading many to suspect she was involved in espionage. Read a book involving spies or espionage. The Haunting of Hannah Williams: In 2018, Hannah Williams bought a house in Los Angeles, and she is convinced that it is haunted by a malignant spirit of some kind. She receives a house call from Ryan and Shane, who explore her home with a medium and attempt to find out what is haunting her. Read a book involving ghosts or spirits. The Historic Disappearance of Louis Le Prince: Louis Le Prince was a French inventor and is widely believed to have been the creator of an early version of the motion picture camera – not Thomas Edison. But before Le Prince could unveil his invention to the world, he mysteriously disappeared, and Edison went on to be heralded as the father of motion pictures. To this day, few people have heard of Le Prince. Read an unknown book or a book that has less than 500 ratings on Goodreads. The Haunted Town of Tombstone: The small town of Tombstone, Arizona, went down in history due to the 30-second gunfight at the O.K. Corral, between a group of outlaws called the Cowboys and lawmen. Read a book about an outlaw/a group of outlaws. The Odd Vanishing of Amelia Earhart: Amelia Earhart was the first female pilot to fly solo across the Atlantic Ocean. Her mysterious disappearance during her circumnavigational flight across the Earth in 1937 has made her go down in history. Read a book with a female main character. The Harrowing Hunt for Bigfoot: Bigfoot is believed to be a massive ape-like creature that lives in North American forests. He is a creature of folklore, but many believe to have seen the creature in real life, and some anthropologists work to prove his existence. Read a book about a mythical creature/monster. The Strange Disappearance of D.B. Cooper: D.B. Cooper is the name of an unidentified man who, in 1971, hijacked a Boeing 727 plane, demanding a $200,000 ransom from the U.S. government. After he received his money, Cooper parachuted off the plane … and was never heard from again. The FBI launched a massive hunt for him, but he was never found, and the case of D.B. Cooper remains the biggest unsolved air piracy case in history. Read a mystery or thriller book. The Haunting of the Salem Witch Trials: The Salem Witch Trials were a chain of trials, prosecutions and executions of people accused of witchcraft in Salem, Massachusetts from 1692 to 1693. Fourteen women and five men were killed. It is still viewed as the deadliest witch hunt in American history today. Read a book involving witches. The Horrifying Murders of the Zodiac Killer: The Zodiac killer was a serial killer that went on a horrific spree from 1968 to 1969. He is most famous for his taunts, letters and ciphers to the police and detectives investigating him, which he signed with a zodiac symbol. To this day, his identity remains a mystery, and many “copycat” killers have taken inspiration from him. Read a retelling. The Secret Society of the Illuminati: Historically, the Illuminati is a secret society founded by Bavarian men in 1776. The secret society opposed religion, abuses of state power, and the deliberate prevention of knowledge (obscurantism). It went into decline around 1798. However, many conspiracy theorists believe that the group still retain power and have even gone so far as to secretly control the entire world, mainly through the cloning of celebrities, and that their goal is to enforce a totalitarian world government. This is known as the New World Order. Read a book about or involving a secret society. The Suspicious Assassination of JFK: John F. Kennedy was the 35th President of the United States. In November 1963, he was assassinated in Dallas, Texas by a man named Lee Harvey Oswald. At least, that’s what the government said. Oswald was arrested 70 minutes after the shooting, and two days later, Oswald himself was assassinated by a man named Jack Ruby, who later died awaiting trial. Read a book about or involving an assassin. The Demonic Goatman’s Bridge: Also known as the Old Alton Bridge, this bridge connects the cities of Denton and Copper Canyon in Texas. According to local lore, the bridge and the surrounding forest is believed to be the home of a satyr-like demon, that attacks people who attempted to walk on his bridge. Read a book about or involving demons. The Thrilling Gardner Museum Heist: In 1990, the Isabella Stewart Gardner Museum in Boston fell victim to a heist. Two men posing as policeman gained entry into the museum and proceeded to rob 13 pieces of art, valued at more than $500 million. The artworks have never been recovered but as of 2018, Interpol and other connected agencies believe they are getting close. Read a book involving a heist or thieves. 3 Horrifying Cases of Ghosts and Demons: The Winchester Mystery House, the Island of the Dolls, and the Sallie House – a collection of horrifying locations widely purported to house ghosts and even a demon. Read a collection of short stories/anthology. The Treacherous Treasure Hunt of Forrest Fenn: In 2000, art dealer Forrest Fenn reportedly buried treasure worth over a million dollars somewhere in the Rocky Mountains – mountains that span the US and Canada. It is believed that the value of the treasure is worth over $10 million today. As of July 2017, the treasure has not been found. Read a book involving an adventure or quest. If you find yourself running out of time to solve the case, or you simply don’t like one of the book prompts, there are two ways that you can “cheat” to complete the readathon. You can use both of these characters once each. In many true crime episodes, there is a corrupt cop who prevents the carrying out of justice. From the murders of Tupac Shakur and Biggie Smalls where police blatantly ignored obvious clues, to the Keddie cabin murders where the sheriff had evidence sealed in an envelope, locked in a drawer, that was never considered, corrupt cops take many forms. By using the Corrupt Cop character, you take a bribe from a shady, anonymous person which allows you to skip one reading prompt and move onto the next clue. This character can only be used once during the readathon. In many unsolved supernatural episodes, aliens are a common enough occurrence, from strange lights in the sky to vanishing airplanes to abductions. By using the Alien character, you’ll be abducted from your spot on the Investigation Board and transported to another reading prompt, skipping one clue. This character can only be used once during the readathon. Will you be joining #UnsolvedAThon? If so, which avatar path do you think you’ll follow: Ryan or Shane? Please comment and let me know if you’re joining, and remember to post your TBRs in the sign up! Don’t forget, a post of book recommendations for each prompt will be up on March 14! This sounds like a great readathon. I feel like its a bit late to join in now but will you be holding it again anytime soon? I think I might just take you up on that offer. Thank you! yeah fair enough, college is super stressful!